An aortopulmonary collateral is a common cause for hemoptysis in children. Pulmonary arterio venous fistula (PAVF) resulting from a portosystemic shunt can cause significant systemic hypoxemia. Here we report a rare association of PAVF and an aortopulmonary collateral in a patient with persistent ductus venosus (PDV). Both were addressed percutaneously. An eight-year-old boy, presented with a history of hemoptysis (50 ml per episode, thrice) for one week. The X-ray of the chest was unremarkable and the screening echocardiography was normal. Pulse oximetry and blood gas showed oxygen saturation of 80%, when the patient was comfortable at rest. Contrast echo with agitated saline done to rule right to left shunt, showed delayed appearance of bubbles in the left atrium after four cycles, suggestive of pulmonary arteriovenous fistula (PAVF). Contrast-enhanced computed tomography (CECT) revealed two small (2 mm) aortopulmonary collaterals at T6 - T7, one on each side, no major PAVF, features of aspiration in the right upper lobe, and an incidentally detected persistent ductus venosus (PDV) [Figure 1]. 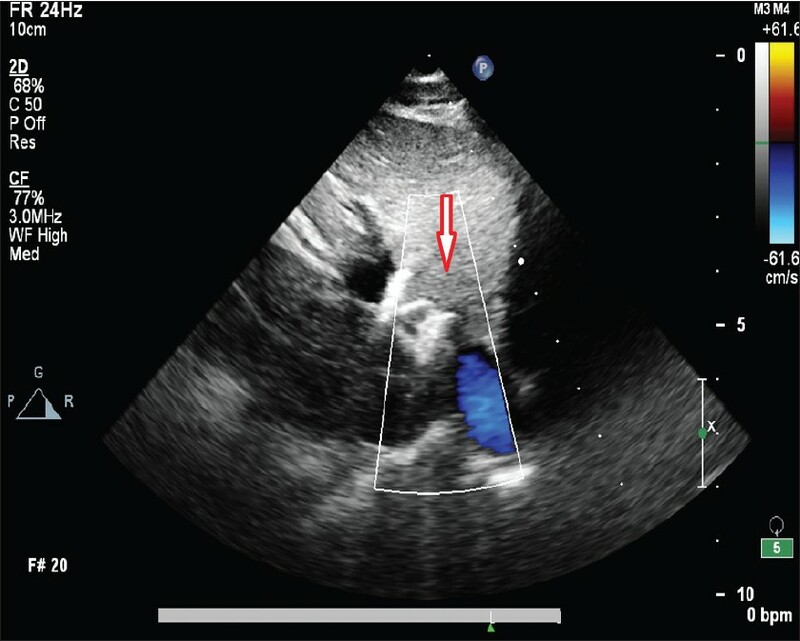 The ultrasonogram and echocardiography confirmed a PDV of 6.5 mm diameter, opening into the inferior vena cava (IVC) [Figure 1] and [Video 1] and no evidence of liver disease or portal hypertension. The diagnosis of congenital portosystemic shunt due to PDV, causing PAVF was made. The aortopulmonary collateral arteries (APCA) were considered to be secondary to systemic hypoxemia. However, the cause of hemoptysis was not clear (aortopulmonary collateral or PAVF). The patient was taken up for percutaneous intervention of PDV and aortopulmonary collateral. A pulmonary angiogram showed diffuse bilateral multiple small PAVFs [Figure 2]. The PDV was entered from the internal jugular vein access. Test balloon occlusion showed adequate hepatic portal circulation and no increase in portal pressure from the basal 10 mmHg [Figure 3] and [Video 2]. Through a 7F Mullin sheath, a 12 mm Amplatzer vascular plug II (St. Jude Medical, St. Paul, Minnesota) was deployed [Figure 4] and [Video 3]. The APCAs on both sides were selectively cannulated [Figure 5]. The right APCA was cannulated with a 4F right coronary artery (RCA) catheter and coiled with two 035 inch 2 mm - 30 mm platinum fiber coils (COOK MEDICAL INC. Bloomington). The left APCA could not be coiled. There was no recurrence of hemoptysis in the next 48 hours and the patient was discharged. The follow-up plan was to monitor the oxygen saturation for regression of PAVF and an ultrasonogram to rule out portal hypertension. Congenital portosystemic shunts are extra hepatic (abernethy malformation) and intrahepatic (persistent patent ductus venosus). , Portosystemic shunts result in by-passing of the liver by splanchnic circulation. It results in complications like hepatic encephalopathy, pulmonary hypertension, and hepatopulmonary syndrome (PAVF with arterial hypoxemia). The microscopic nature of PAVF, not detectable by CECT chest has been reported. APCAs are usually seen in cyanotic congenital heart disease with decreased pulmonary blood flow, like Tetralogy of Fallot, with or without pulmonary atresia. Developmentally, they arise between three to four weeks of gestation and are considered to be a persistence of the fifth arch or the intersegmental arteries of the dorsal aorta. However, in the index case it is probably postnatal development due to persistent hypoxemia, due to PAVF. 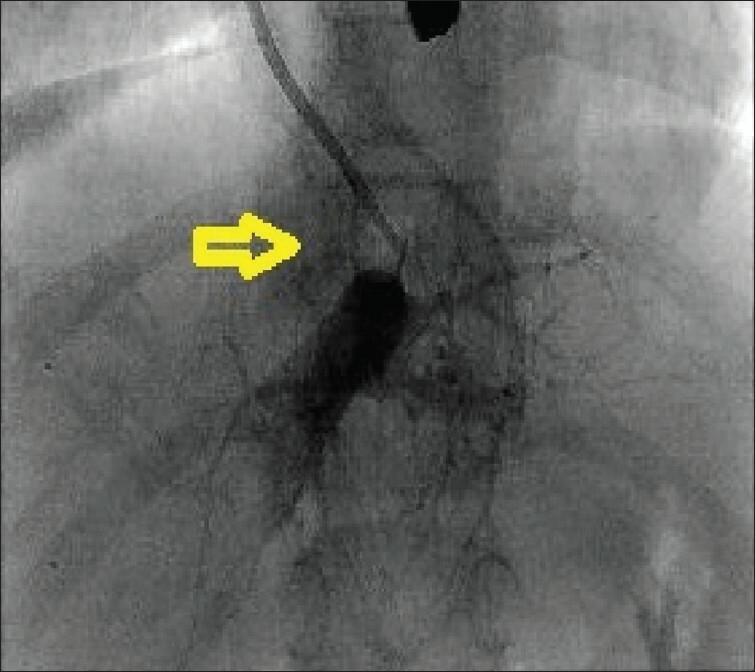 Percutaneous closure of a portosystemic shunt needs detailed anatomical evaluation of the portal vein, inferior vena cava (IVC), and the connecting channel. It requires meticulous planning of the procedure with respect to vascular access, appropriate imaging, and suitable hardware. Prior to closure, it is important to ensure adequate portal vein hepatic ramification and normal portal pressure by test balloon occlusion and an angiogram. Closure of the ductus venous should be done as close to the IVC as possible, to avoid portal vein occlusion. In conclusion, persistent ductus venosus can lead to pulmonary arteriovenous fistula and hemoptysis. Percutaneous device closure requires meticulous planning and detailed anatomical and physiological evaluation. 1. Stringer MD. The clinical anatomy of congenital portosystemic venous shunts. Clin Anat 2008;21:147-57. 2. Yoshimoto Y, Shimizu R, Saeki T, Harada T, Sugio Y, Nomura S, et al. Patent ductus venosus in children: A case report and review of the literature. J Pediatr Surg 2004;39:E1-5. 3. Senguttuvan NB, Kumar J, Kothari SS. "Treatable" diffuse pulmonary arteriovenous fistula- An unusual cause. Ann Pediatr Card 2011;4:215-6.